Today was not quite a setup day and it was not quite an full operations day. The convention officially begins on Monday, but the setup part is mostly over. Yesterday was shortened due to the impending security sweep so we hurried to get everything done before 5:00 PM that we possibly could. We’d been told that the site would be open again at noon today. So I relaxed and took a lazy approach to the morning. We headed over to the site a little after noon to see how things stood after the sweep. Things stood in line. A long line. 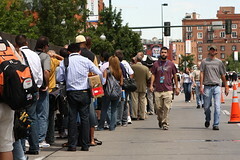 Everyone– DNC personnel, media personnel, vendors, contractors– was funneled through a single checkpoint, and security was unprepared for the volume of people and equipment that needed to move through. So we encountered delays. It took a little longer than an hour for me to get through the security checkpoint. Once inside, the activity level continued to rise. I spent most of the afternoon working with the photographers that arrived on site. Our one outstanding issue from yesterday was power on the central camera platform, so that was a concern to not just our photographers but all the photographers who had positions there. The rest was primarily familiarizing them with what we had set up and how they could expect it to work: in our workspace, in the digital darkroom, on the photo platform. I took Tom Ferrara of Newsday on a tour of the photography facilities in the bowl. Talked at some length with Milbert Brown of the Chicago Tribune about possible ways to mount cameras on the central photo platform. And after all of that I turned into a paparazzi, myself, as CNN started doing live shots from the convention floor. I got a couple photographs of Gloria Borger, Wolf Blitzer, and Anderson Cooper setting up for their evening show. The extent of CNN’s presence at this convention is impressive. I’ve already talked about their takeover of Brooklyn’s and conversion to the CNN Grill. Yesterday they were doing shots from the roof, patio and interior of that building, from their two suites in the bowl, and from the convention floor. While the breadth of their coverage is impressive, I wonder about the depth of the coverage. This may be my prejudice toward print journalism and the written word. I do wonder if universal access– meaning cameras everywhere– adds significantly to the quality of the news being reported. The night ended with a party for the media at Elitch Gardens. The Democratic National Party has bought out Elitch’s for two weeks: the week preceding and the week of the convention. We got a chance to go inside. Most of the rides were running. They had food and drink catered. 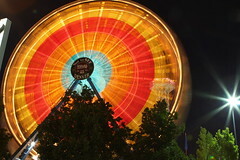 One of the treats my parents gave me growing up was to take us to Elitch Gardens at the end of the summer. It has been a long time since I have been back. A lot has changed, including the location, but much of it remains the same. I wandered around the grounds thinking I was twelve-years old again. Tomorrow will be a big day as almost all of our editorial staff arrives and looks to get set up. It’s all happening. It’s all happening!